Topics: Chicago Plumbing Services, Plumber Services In Chicago, Frequently Asked Plumbing Questions, and Chicagol Plumbing Coupon. The site has about 14 users daily, viewing on average 1.40 pages each. Godaddy.com Inc (Arizona, Scottsdale) is the location of the Apache server. ns45.domaincontrol.com, and ns46.domaincontrol.com are its DNS Nameservers. 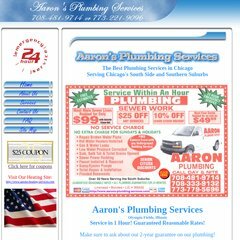 Aarons-plumbing-services.com's IP address is 72.167.232.198. PING (72.167.232.198) 56(84) bytes of data.